Google Africa Developer Student Club (DSC) lead program 2018 for students across Africa. Application Deadline: 14th May, 2018. In July 2017 we announced a series of initiatives focused at providing mobile developer trainings to 100,000 developers in Africa. Today, as part of that commitment, we will be kicking off our Developer Student Club (DSC) program aimed at providing the African student community a head start on latest technologies like Machine Learning, Artificial Intelligence and Mobile & Web Development. 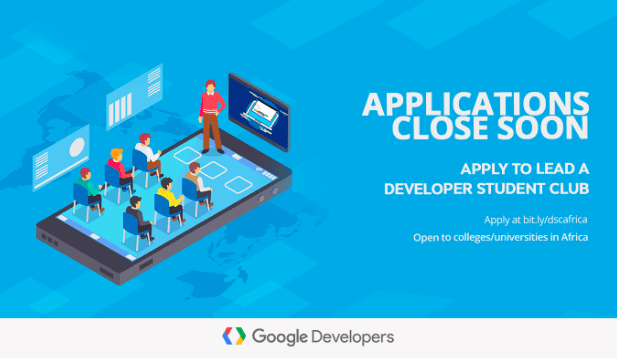 The Developer Student Club (DSC) program is a Google Developers initiative designed to provide a space for students (enrolled in accredited colleges/universities in Africa) to build their mobile and web development skills and knowledge while solving local business problems around their institution. Through this program our teams will be providing much needed support to students in campuses across Africa.As part of preparations towards kicking off this program in the region, we are now commencing with the recruitment of student leads to head our different DSC chapters across campuses in Africa. A DSC lead is a student leader on campus whose mission is to use technology to make a difference, not only in their universities, but also in their communities more widely. An eligible candidate for the new DSC lead roles are students currently enrolled in a computer science course or related engineering discipline at any accredited college/university in Sub saharan Africa. Committing for one-year (2018/19 academic year) to act as a Student Lead. If you are interested in this opportunity, or want to learn more, please visit bit.ly/dscafrica or send an email to dscafrica@google.com.